Cetonia can offer non-stop, ”door to door” transports with vessels from Sheerness, Rotterdam, and Kiel to Holmsund, Sundsvall, and Oxelösund. Ro-Ro shipment is a safe, fast and cost effective alternative form of transport all year around. SCA:s Ro-Ro- ships depart every week fromSheerness, Rotterdam and Kiel. 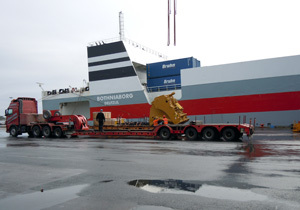 The cargo is loaded on ”cassettes” (12 x 2,5m), in trailers or are ”self-going” for transports between the harbours. The alternative to cassettes are non-stop transports in conventional trailers or self-going machines or cars. The vessels are built 1996 with highest available standard and use low-sulphur oil and are ISO 9002 classed.